We have no minimum order value or number. We aim to ship all the orders placed before 1PM (GMT+1) the same day. We asked your understanding that during peak moments it may take longer. All parcels will be shipped with UPS. You'll receive an email with a track and trace code. Please note that pallet shipments have other transit times. Our sales team will inform you when the information for pallet shipments is available. 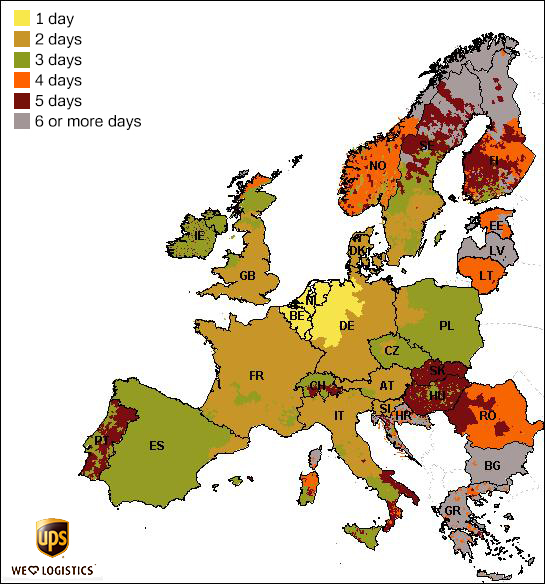 Please see below the indicated transit times of UPS. To send your order we charge shipping costs, these vary by country of destination. See below the costs that we calculate per order. Leg Avenue Europe ships your package DDU, "duties and taxes unpaid", and does not collect the VAT, duties and/or taxes. We cannot predict what your particular charges may be, if any. Leg Avenue Europe has no influence over this process or these possible charges. Customs policies vary widely from country to country, so you should contact your local customs office for further information. Additionally, please note that when ordering from Leg Avenue Europe, you're considered the importer of record and must comply with all laws and regulations of the country in which you're receiving the goods.